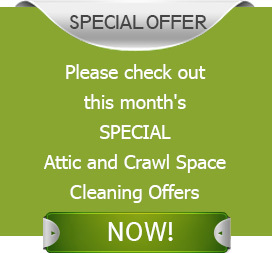 Leaving attics and crawl spaces un monitored for long periods of time is a mistake that can mean troubles! This negligence can have health implications, and an expensive price tag that homeowners are then left to sort out. 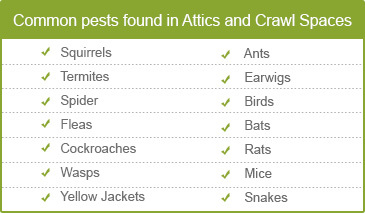 Just because attics and crawl spaces are not as accessible as other parts of the house/building, it shouldn’t mean that they can be ignored. Regular inspections of these functional areas are vital as they help spot looming dangers early on, before they get blown out of proportion. Of course, the existing problems like critters, mold, wood rot and structural deterioration will require serious professional attention, so look no further than Quartz Solutions! We are the undisputed leaders in the industry, equipped with the latest technology and skills necessary to take care of the mess, and protect your home and family. Mold and fungus grow rapidly in humid and moist places. If left unchecked, they can weaken the structural integrity of the property dramatically by eating away at the wood. It can also cause breathing problems. Animals like rodents, mice and squirrels love nothing more than to nibble and bite. They can ruin the insulation, rip wires, vapour barriers and leave behind dirt. Wasps, fleas, spiders, and roaches are general carriers of germs, which can trigger allergies and infections. Leaky duct system and exposed insulation are potential risks for losing energy and increasing heating or cooling costs. An in-depth inspection of the attic and crawl space including testing for radon gas, a known carcinogen, is an important step towards keeping the living space comfortable, hygienic and healthy. Our experienced crew will visit your home or office for a free preliminary analysis. Once they have checked out all components closely, the experts will identify the defects and lay forth cost effective strategies to eliminate them. At Quartz Solutions, our aim is to provide the highest quality service with the best techniques at a cost efficient price. West New York, in Hudson County, is one of the most densely populated municipalities in New Jersey. A staggering 52,000 people live within its 1.3 square miles. West New York has an image problem with many viewing it as a litter-strewn, concrete jungle. We at Quartz Solutions would love to enhance the clean sides of West New York by keeping the attics and crawl spaces of the township in tip-top shape. We assure you that no one in the industry can match the quality of service, price, and professionalism offered by us. Call today at 201-205-2042 to book a complimentary inspection, or consultation!